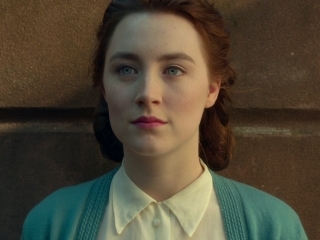 Anyone who loves movies should hasten to see BROOKLYN (2015), a beautifully rendered film with an exquisite lead performance by Saoirse Ronan. It's been a long time since I've seen a "new" movie which left me feeling as though I'd like to go see it again right away. 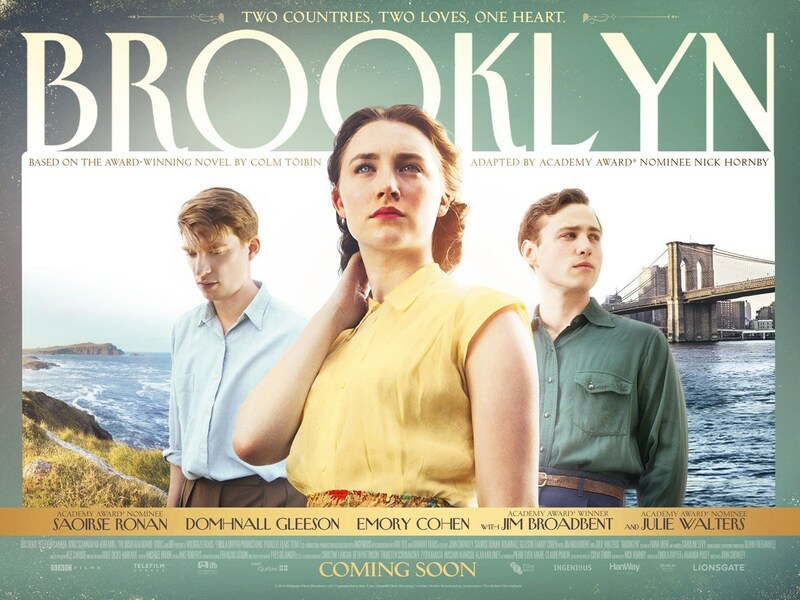 BROOKLYN is that special, and Ronan is wonderful in a movie which has a distinctly classic-era sensibility. Ronan plays young Eilis, whose future in her small Irish village looks like a dead end, so her loving older sister Rose (Fiona Glascott) arranges for a priest (Jim Broadbent) to sponsor Eilis so she can have a new life in New York. Eilis lives in a Brooklyn boarding house with other recent immigrants, and the priest arranges a job for Eilis at an elegant department store; he also pays the first semester of tuition so she can attend night classes in bookkeeping. Eilis struggles mightily with homesickness, but with her interest in her classes and the friendship of a smiling young Italian man named Tony (Emory Cohen), she begins to feel happy about her life in America. Eilis and Tony's relationship is developing into something deeper when tragedy strikes in Ireland and Eilis returns home for a visit, during which she must make a permanent decision about her future. This is a movie which is engrossing from first frame to last, and Ronan is in almost every second of it. She has some of the most beautiful, sensitive eyes I've ever seen on film, as well as the ability to convey her thoughts wordlessly. I don't know when I've enjoyed a performance more. She is mesmerizing. She's matched by Cohen as Tony, a genuinely goodhearted, decent young plumber who falls for Eilis almost from the moment he sees her. Together they paint a picture of a couple who feel genuine and real, rather than actors or movie stars. One can easily imagine this young couple achieving the American dream together, running a family construction company. The one quibble I have with the film is that Eilis' choices in the final section of the film are contrary to the honesty and sensitivity she has exhibited up to that point, not to mention the courage she had shown traveling to New York without knowing a soul. I suppose one could chalk up the human frailty she shows at this point to grief, guilt, and curiosity about what life could be like if she remained in Ireland, but it was disappointing to see her lead on a couple of other characters to have hopes that could not be. When reality smacks her upside the face and she commits to it, it comes as both relief and joy. Tying in with that thought, one of the film's pleasures is there are no villains. Mrs. Kehoe (Julie Walters), the boarding house landlady, is both snarky and supportive. Likewise, Eilis's department store supervisor, Miss Fortini (Jessica Pare of MAD MEN), is an exacting boss but she is also understanding. A fellow passenger on the ship (Eva Birthistle) is bossy, claiming her lower berth bunk, but she's also very helpful, and she's kind when it's needed most. The boarding house girls can be silly and thoughtless, yet again they also offer support. In short, the characters are fully rounded and human. 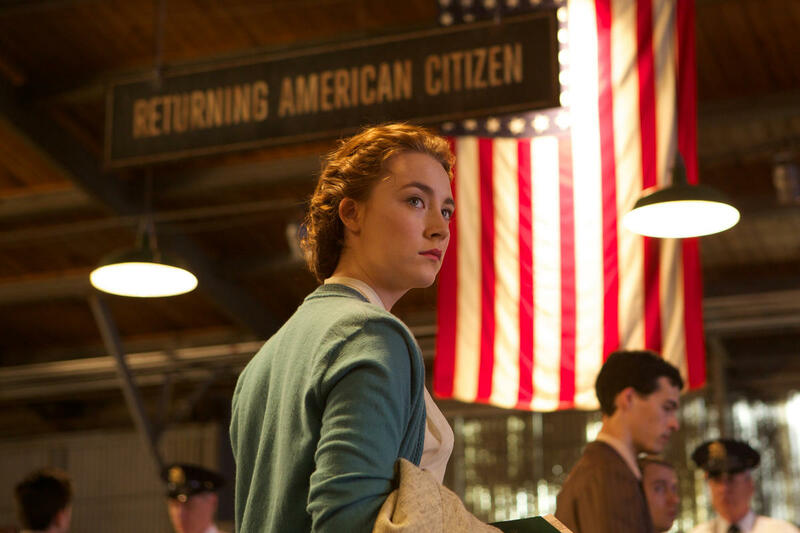 BROOKLYN also succeeds in believably creating a mid 20th Century world which feels real and organic. Too often when watching a recently made period piece one is aware that the cast is simply play acting with background extras and fake computer-generated backgrounds, with potential anachronisms hiding in every corner. (THE IMITATION GAME and SAVING MR. BANKS are two cases in point.) 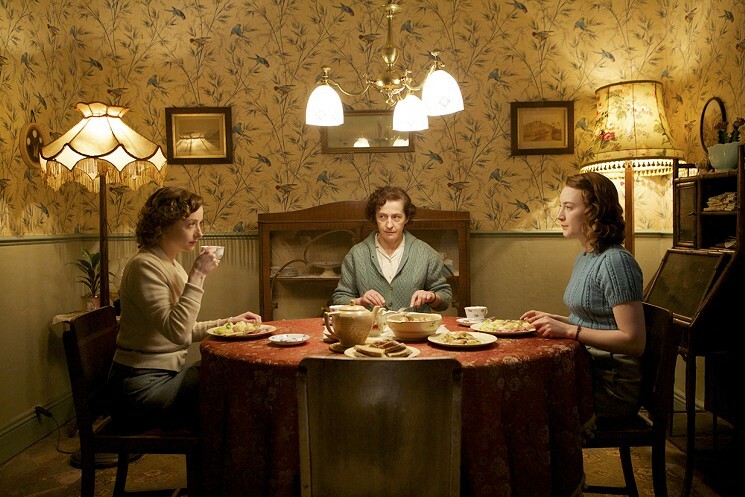 I was never distracted out of the era while watching BROOKLYN, and the warm cinematography by Yves Belanger suits the time period depicted. BROOKLYN was directed by John Crowley. The script by Nick Hornby was based on a novel by Colm Toibin. The supporting cast includes Domhnall Gleeson, Jane Brennan, Brid Brennan, Eileen O'Higgins, and James DiGiacomo, who is hilarious as Tony's smart-mouthed little brother. 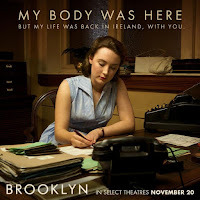 Parental advisory: BROOKLYN is rated PG-13 for one brief love scene and for brief language. For the most part it is a family-friendly film. The trailer is at the film's official website. I enjoyed seeing this as much as anything I've seen this year. Very highly recommended. Laura, thanks so much for this enjoyable and useful review. I feel I know your taste enough to thoroughly trust it - I feel sure this will be my kind of film too! I had vaguely heard good things here about 'BROOKLYN' - now I shall go out of my way to find it. There is obviously a large Irish input, talent-wise and I am never disappointed by a performance from the English actor Jim Broadbent. I will report back if I manage to see it. I hope you can see it and enjoy it, Jerry! The cast is excellent. I am still thinking about it a day later. I may well go back and see it again in a few days. Please let me know your thoughts if you're able to see it! Great review Laura. Some of Eilis decisions in the final section of the movie bothered me too. But I saw a great interpretation of the movie where everything including Tony & Jim were supposed to be metaphors for the immigrant experience. I further wrote out my own interpretation using this same idea on IMDB http://www.imdb.com/title/tt2381111/board/thread/250179821?p=2&d=250693678#250693678 but it has spoilers for anyone who is reading who hasn't seen the movie. Thanks, Kim! I enjoyed your comments and positive take. One thing I read somewhere which made sense to me is that in Ireland she would essentially have someone else's life -- sister's job, Jim's parents' house, etc. Pleasant but not something of her own making. (Not to mention that it really couldn't be because of a decision she'd already made...it was almost more of a dream sequence in her life, exploring and then waking back up and valuing what she already had.) Her future with Tony would be what they created with her education and his work ethic and dreams. Jane, I'm absolutely delighted that you and your mother went to see this and enjoyed it! Especially as you gave me such a good tip with THE 33. Glad we could guide one another to good movies over the past couple of weeks! Thank you so much for letting me know.